The length of time that orchid blooms will last in good condition depends on several different factors, including the genus, species and ambient conditions. It can vary from as little as three hours to three months or even more! The flowers of most cymbidium hybrids will last for at least two months, either under cover outdoors or under cool conditions indoors. 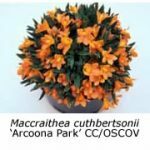 However, in a centrally heated house, where the relative humidity is usually quite low, the blooms may last for only a few weeks. It’s OK to display your flowering cymbidiums in a heated house for a few hours but you should then move them outside to recuperate. 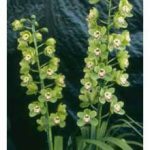 Cymbidiums that bloom in the first half of the year generally don’t have such long-lasting blooms as those that flower in late winter and spring. That’s partly attributable to the species from which they’re bred and partly to the warmer ambient conditions that prevail in autumn. If you want to prolong the life of an orchid so that it’s still OK for an up-coming show, you can move it into a cool, dark position, for example, in your garage. But remember that, while it’s in the dark, it’s not putting on any growth, so don’t expect it to flower quite as well next year. The flowers of most Australian native dendrobiums don’t last anywhere near as long as those of cymbidiums. If kept cool most last for a few weeks but they tend to finish quickly when those hot, northerly winds begin to arrive in October. Sarcochilus flowers also last only a few weeks before those lowermost on the inflorescence begin to fall. The flowers of Sarcochilus ceciliae and its hybrids open sequentially over a long period, so it’s generally impossible to have all open together at the same time. 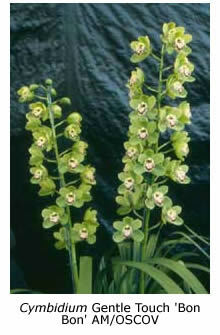 Most orchid judges recognise this behaviour and do not penalise it. 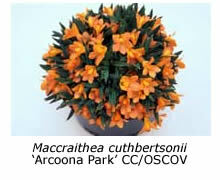 However, in the case of other sarcochilus hybrids, fallen flowers may be penalised. Flower life may vary greatly, even within the same genus. For example, the flowers of Dendrobium cuthbertsonii (syn. Maccraithea cuthbertsonii) and other species in the section Oxyglossum of Dendrobium generally last for several months, sometimes as long as six months. In contrast, the flowers of Dendrodium thrysiflorum (and other species in the section Callista) last only a week or two, while most species in the related genus Diplocaulobium (found in PNG) last only a day or two. It follows that the latter species must be highly attractive to their pollinators, otherwise they could not perpetuate themselves. Probably the most short-lived flowers of those orchid genera in common cultivation are stanhopeas. The flowers are so stiff, thick and shiny when they first open that it’s hard to believe that they will begin to wither in only three days. Luckily, their flowers create a greater impression in those three days than do many others that last for weeks.